I've got to come up with a better picture management strategy. I finally got around to looking through our honeymoon photos and it brought back so many fun memories! It also made me a little nostalgic - how has it already been five years? 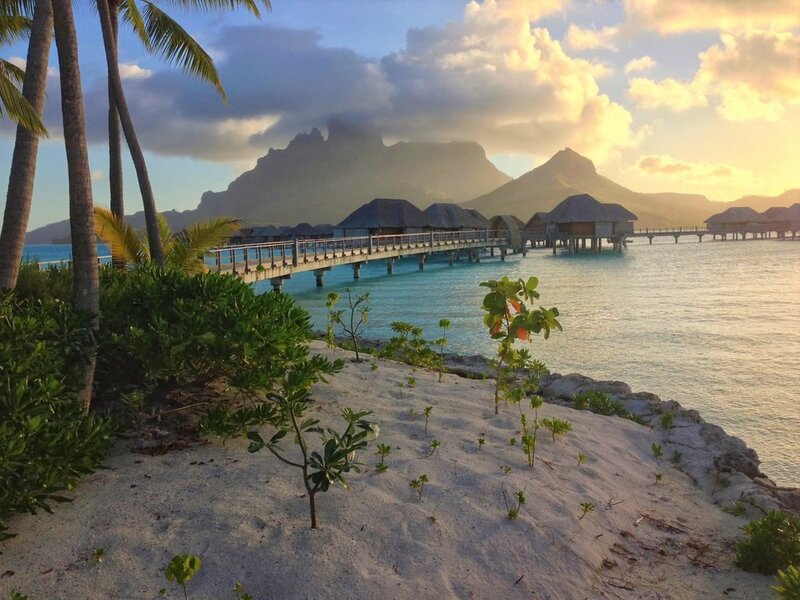 The water in Tahiti is truly stunning. It has Hawaii and the Caribbean beat - and that's really saying something. So, I had to share a few of these beauties! 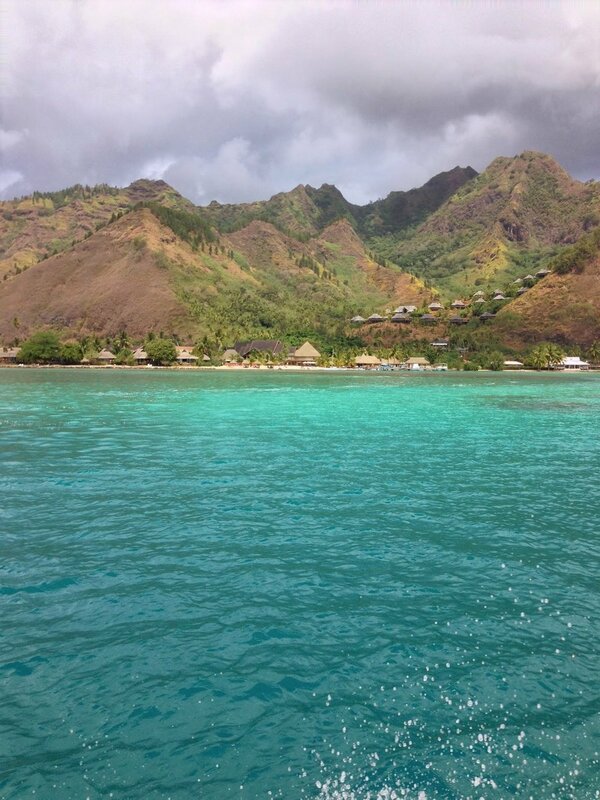 We flew in and out of LAX to Pape'ete, Tahiti (an easy eight-ish hour flight) and spent a week on Moorea before taking an island hopper over to Bora Bora for another five days. After all the wedding excitement, stress and celebrating, Brian and I were so ready to unplug and relax. And that's exactly what we did! There are tons of unhealthy-looking feral dogs roaming around which made me very sad because I wanted to rescue them all. We didn't have a lot of luck with finding great dining options - especially because I don't eat meat. Although, the restaurant at Legends was amazing! I was grossly underprepared for the bug situation. Every night, after enjoying a gorgeous sunset, we were subject to a cockroach and gecko invasion. And when I say gecko, I'm not talking about the cute little ones you see in Hawaii. These guys were beefy. All that said, the resort was stunning and the island is beautiful. But, I'd be lying if I said I wasn't a little relieved when it came time for us to leave for Bora Bora. This was the view from the pool at Legends. We snapped it right before heading to the airport and onto Bora Bora! 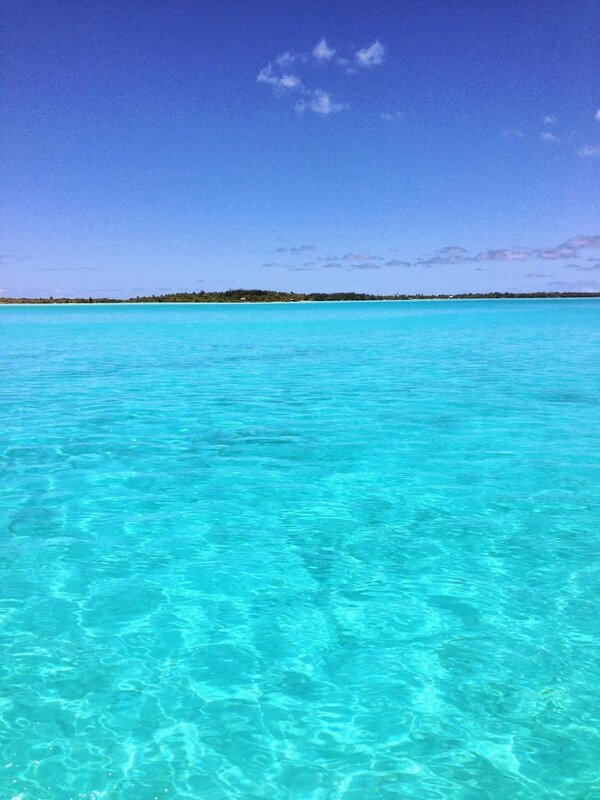 I’ve never seen water so blue. The unbelievably turquoise lagoons of Bora Bora took my breath away. As our plane touched down on a tiny strip of land, I could barely contain my excitement. THIS was what we’d come for. 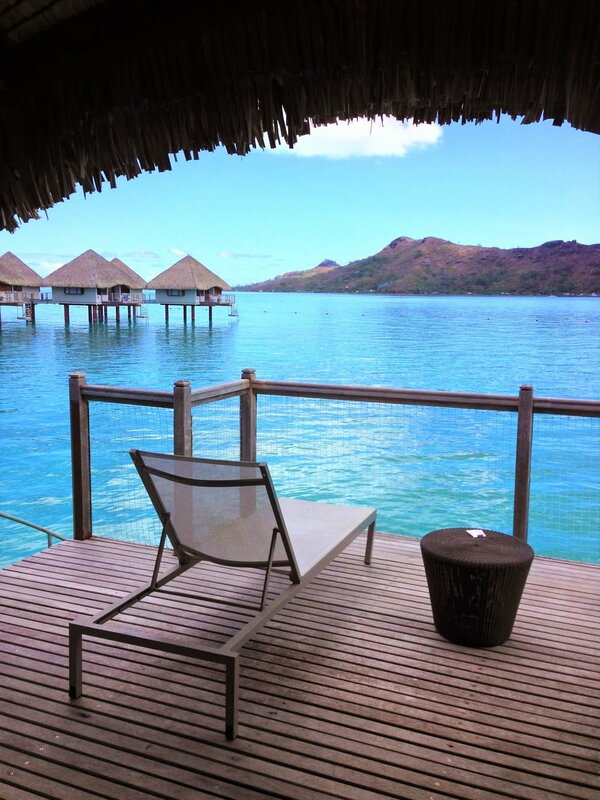 This was the view from our over-water bungalow at Le Meridien. I still can't get over that crystal clear water! Disembarking at the Bora Bora airport is an incredibly unique experience because you land on a skinny little island surrounded by stunning blue water. Once inside the tiny terminal, we were greeted by an ambassador who took our bags and whisked us away to our hotel. 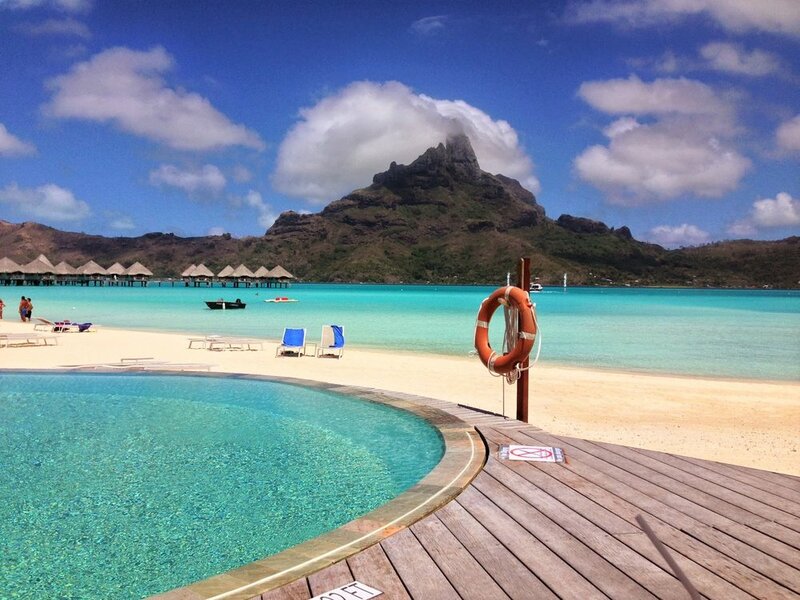 (Sidebar: lodging in Bora Bora is crazy expensive. The Le Meridien was more than a splurge - it was a spending rampage that could only be justified by the fact that this was our honeymoon. But I'd do it all over again in a heartbeat)! Waiting for our water taxi at the Bora Bora airport. Our ambassador led us to a water taxi that was waiting just outside. 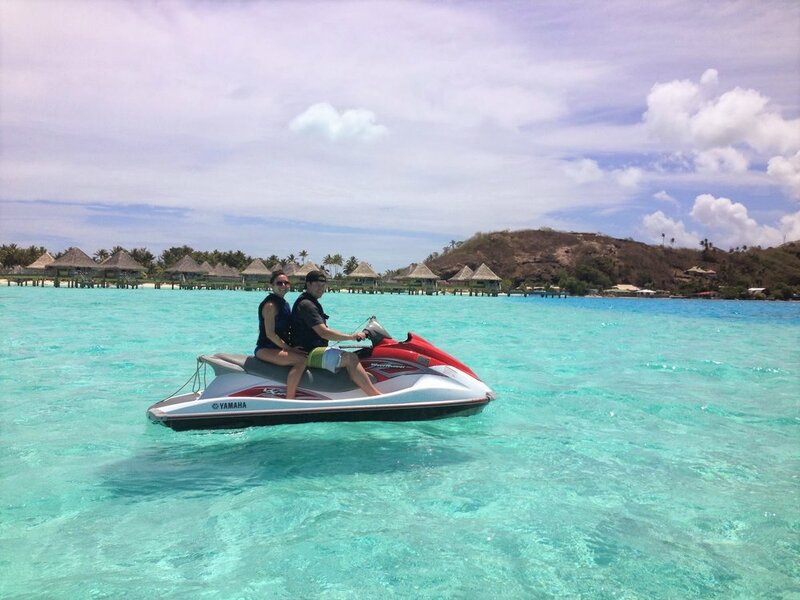 We climbed aboard and took off across the crystal clear waters toward our resort. When I say crystal clear, I am not kidding. I could easily make out stingrays about thirty feet down. You can literally see straight to the bottom. 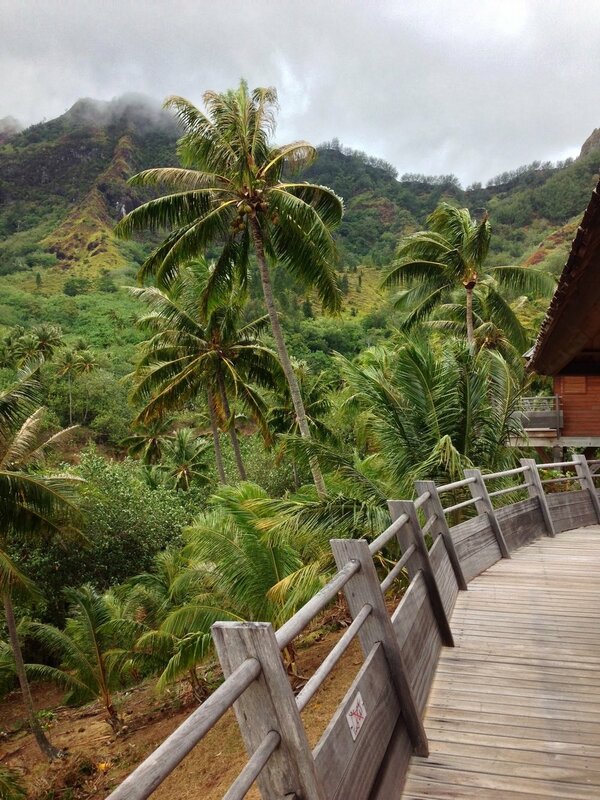 After checking in, we were escorted by golf cart to our overwater bungalow (with an unobscured view of Mount Otemanu!). 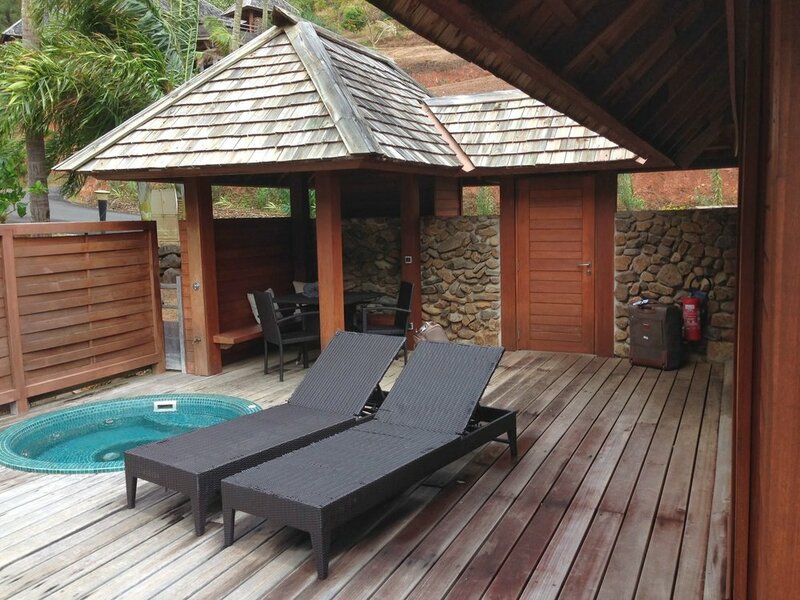 The room was incredibly modern and recently renovated, with a large glass floor in the center. The bright turquoise water reflected upwards and gave the room a bluish glow. 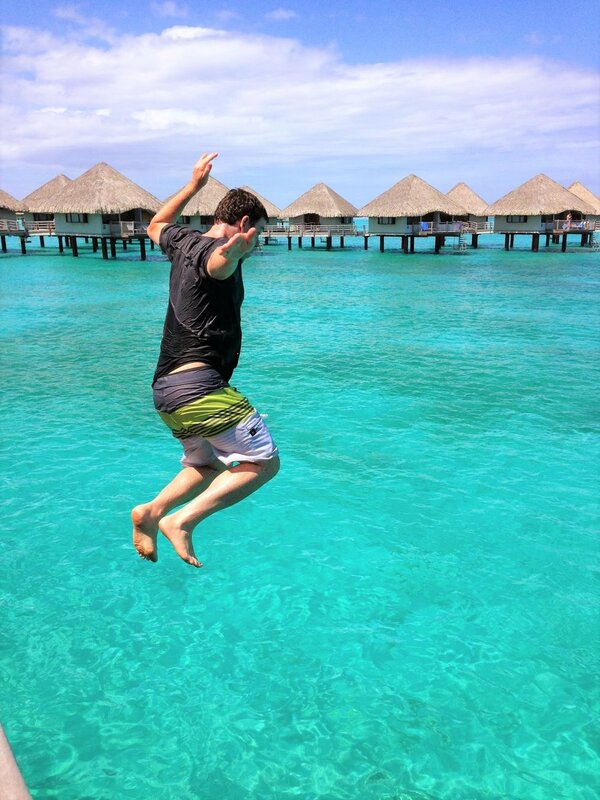 Before I knew it, Brian had jumped off our deck into the incredible water. I felt like I was living in a postcard. While on Bora Bora, went kayaking, swimming, and jet skiing, laid out on the beach and by the pool, ate a lot of food (later, wedding diet!) 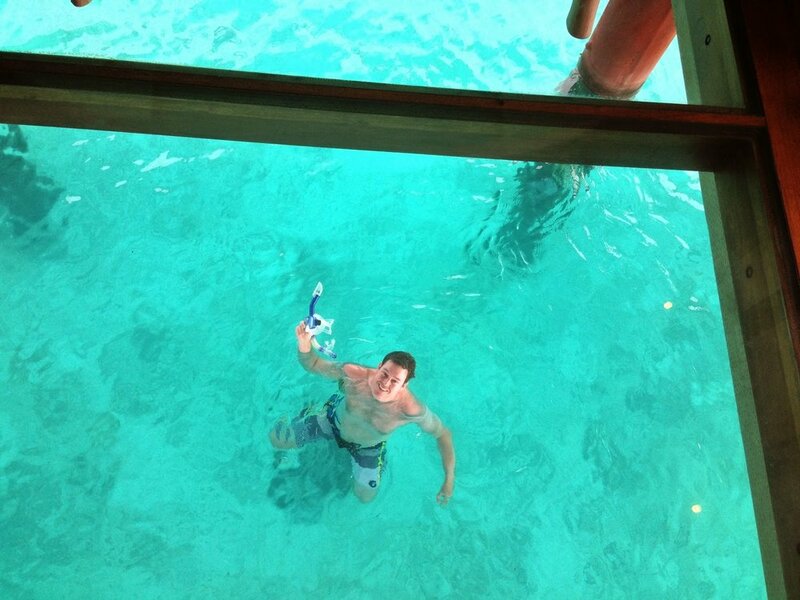 and enjoyed plenty of tropical drinks. It was probably the most relaxed I've ever been! We also got to watch some seriously stunning sunsets. ...and snuck off to the Four Seasons for a date. Which, it turns out, is frowned upon. Le Meridien strongly preferred that we stay on site, but we were itching for some (veggie) sushi! You're not going for the dining experience (unless you spring for a super fancy resort, the food is just OK). You won't be very mobile. 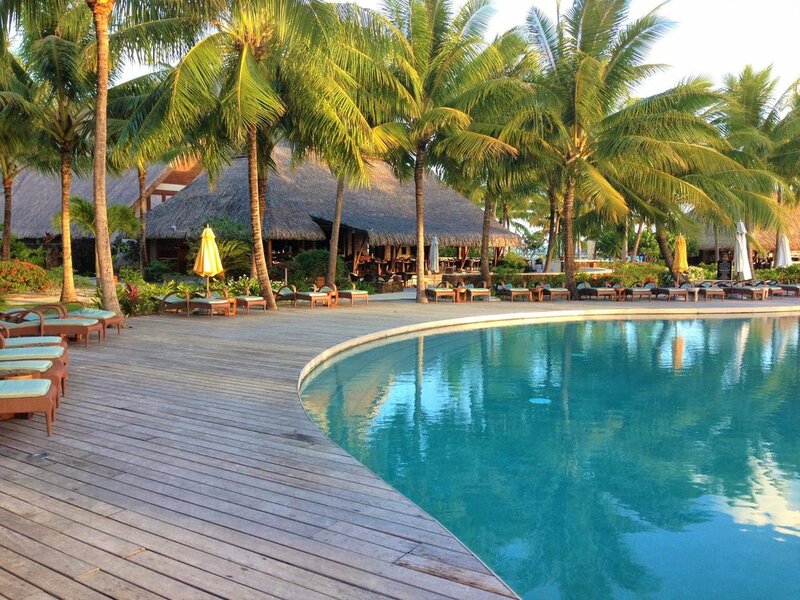 Once you're at your resort, you can't walk to another hotel but you can order a water taxi or take the ferry to the main island of Vaitape. Everything is incredibly expensive. So, bring lots of non-perishable snacks! All of that stuff is minor when you consider the big picture. I mean, just look at that water! We should totally go back for our anniversary, right? !